Garmin Oregon 450 combines rugged outdoor touchscreen navigation with a digital camera. The Garmin Oregon 450 includes built-in basemap, high-sensitivity receiver, barometric altimeter, electronic compass, microSD card slot, 3-inch colour display, picture viewer and more. Garmin Oregon 450 compact high-resolution 3-inch diagonal TFT colour display handheld GPS device accepts Garmin microSD cards for adding optional maps on the go. You can even exchange tracks, waypoints, routes and geocaches wirelessly between similar units. The Garmin Oregon 450 is powered via two AA batteries. Garmin Oregon 450 has been discontinued. Accessories are still available for your Oregon 450 click here. Likewise for Oregon 450 maps click here. Garmin Oregon 450 leads the way with a tough, 3-inch diagonal, sunlight-readable, colour TFT touchscreen display. Its easy-to-use interface means you’ll spend more time enjoying the outdoors and less time searching for information. Both durable and waterproof, Garmin Oregon 450 is built to withstand the elements. Bumps, dust, dirt, humidity and water are no match for this rugged navigator. Garmin Oregon 450 leads the way with a tough, 3-inch diagonal, sunlight-readable, colour, touchscreen display that offers crystal-clear enhanced colours and high-resolution images. Its easy-to-use interface means you’ll spend more time enjoying the outdoors and less time searching for information. With user-selectable dashboards, you can customise the appearance of your display. Both durable and waterproof, Garmin Oregon 450 is built to withstand the elements. Bumps, dust, dirt, humidity and water are no match for this rugged navigator. 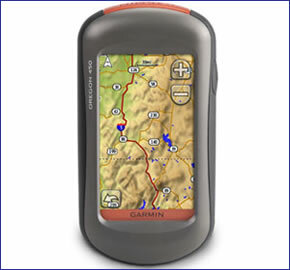 Garmin Oregon 450 comes with a built-in worldwide basemap with shaded contours. Simply touch the colour screen to navigate. Its digital elevation maps show you shaded contours at higher zoom levels, giving you a big picture of the surrounding terrain. Garmin Oregon 450 has a built-in 3-axis tilt-compensated electronic compass, which shows your heading even when you’re standing still, without holding it level. Its barometric altimeter tracks changes in pressure to pinpoint your precise altitude, and you can even use it to plot barometric pressure over time, which can help you keep an eye on changing weather conditions. See changes in your elevation ahead of you and where you've been with enhanced track navigation. With its high-sensitivity, WAAS-enabled GPS receiver and HotFix satellite prediction, Garmin Oregon 450 locates your position quickly and precisely and maintains its GPS location even in heavy tree cover and deep valleys. Go paperless with Garmin Oregon 450 by quickly downloading information from Geocaching.com for up to 5000 caches, such as location, terrain, difficulty, hints and description. The Garmin Oregon 450 is compatible with Garmin’s heart-rate monitors and speed/cadence sensors and can track your speed, distance, elevation and location. With Garmin Oregon 450 you can share your waypoints, tracks, routes and geocaches wirelessly other compatible Garmin Oregon, Colorado and Dakota users. Now you can send your favourite hike to your friend to enjoy or the location of a cache to find. Sharing data is easy. Just touch “send” to transfer your information to similar units. Do you have a question about the Garmin Oregon 450 or other handheld GPS related question that's not been answered on this webpage? Please see our handheld and Outdoor GPS FAQs page for questions from other customers.Plus if the answer to your question isn't featured, use the online form to ask us for the answer. Alternatively please telephone 01733 777623 Monday to Friday (9:30am-5:00pm) to speak to one of our sales team. For further information online please see the Garmin Oregon comparison table. The Garmin Oregon 450 is preloaded with a worldwide basemap with shaded relief. Really bring your Garmin Oregon 450 to life with Garmin's series of mapping available on microSD/SD card, that simply plug directly into the Garmin Oregon 450 handheld GPS. Great for walking, trekking, cycling and more with topographical data provided by Ordnance Survey and road maps provided by NAVTEQ. Garmin TOPO with detailed coverage of England, Scotland and Wales, perfect for your next recreational outing. View available Garmin Oregon 450 TOPO Maps. Explore Great Britain with detailed 1:25k or 1:50k topographic and road maps. Garmin GB Discoverer contains Ordnance Survey Landranger map coverage for either a single National Park to all of Great Britain. Plus, with NAVTEQ road data and points of interest, you'll get turn-by-turn directions to your destinations View available Garmin Oregon 450 GB Discoverer Maps. Garmin BlueChart g2 marine maps feature crisp labeling and an overall smoother presentation on your Garmin Oregon 450 display. In addition to the basic charts, tidal stations, currents, depth contours, IALA symbols and included fishing charts, BlueChart g2 offers improved transitioning between zoom levels and more seamless continuity across chart boundaries. View available Garmin BlueChart Maps. Garmin streetlevel maps available for using with your Garmin Oregon 450 include; UK and Ireland, France and Benelux, Spain and Portugal, Germany, Italy and North America. View available Garmin Oregon 450 City Navigator NT Maps. Looking for accessories to use with the Garmin Oregon 450 handheld device? We sell a vast selection of genuine parts and spares including Oregon 450 slip case, retractable lanyard, carabiner clip, battery charger, bike/handlebar mount, temperature sensor and chirp geocaching beacon. Optional Garmin maps for Garmin Oregon 450 are supplied on SD/microSD Card, these include; street-level road maps - perfect for cycling of using your Oregon 450 in a car, 1:50k and 1:25k Ordnance Survey maps - ideal for hiking and walking the countryside of Great Britain and marine BlueCharts - ideal if you want to navigate the waters around the UK, Europe or further afield. Question: I have a Garmin Oregon 450 GPS unit, bought in 2012. The rubber cover over the power switch has perished somewhat and broken. I am concerned it may allow water or dirt into the unit. Is it possible to buy a new cover for the switch? Is it feasible to replace it? Other than that the unit is still working fine. Answer: While we sell Garmin Oregon 450 accessories we do not sell the rubber cover you are seeking. Can I suggest that you contact Garmin on 0808 238 0000 to enquire whether such a part is available from them? Question: If I upgrade my gps from my Oregon 450 to a new Oregon 700 can I transfer my Garmin discovery OS whole uk 1:50k sd card? Answer: Yes, the Garmin GB Discoverer 1:50k all of Great Britain SD card is not fixed to anyone Garmin device. This means you can simply remove it from one Garmin unit e.g. Oregon 450 SD/microSD Card slot and insert into a different compatible Garmin units e.g. Oregon 700 microSD/SD card slot. Had you downloaded the maps from Garmin, then these would be fixed to the Garmin device you downloaded them to. You can purchase the Garmin Oregon 700 online here. Do you have a question about the Garmin Oregon 450? Submit your question via our contact page.